In a suit of golden armor, Alexander the Great battles valiantly in the town of the Sudracae in India. Having foolishly jumped over the ramparts into the enemy city without reinforcements, he must defend himself in prolonged hand-to-hand combat. 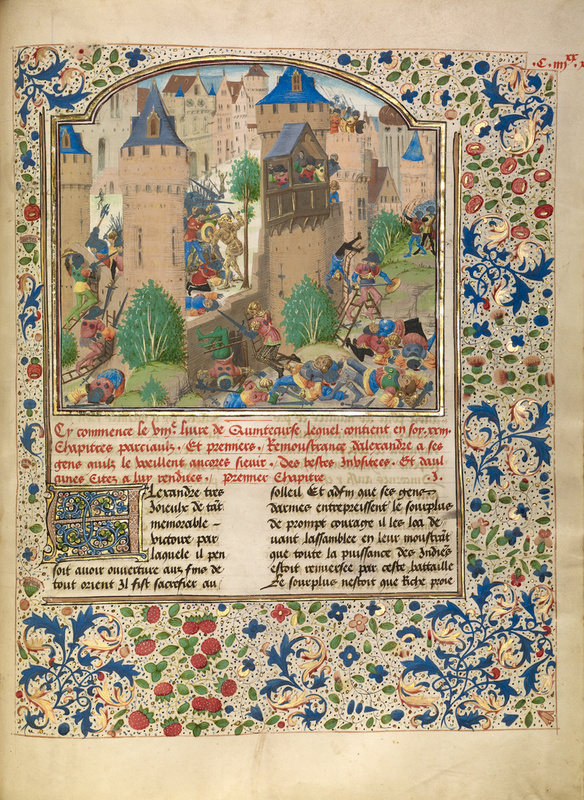 The illuminator used the device of a cut-away view of the city wall in order to show both Alexander within the town and his army outside, attempting to scale the wall to come to his rescue. The entire scene is presented in fifteenth-century guise, with the town of the Sudracae resembling a northern European walled city more than anything Indian. Both the Macedonian and the Indian soldiers are outfitted in the battle gear of the illuminator's time, with little attention paid to distinguishing between the two armies, either in weaponry or in ethnicity. This would have given the scene particular immediacy for a fifteenth-century European reader, especially one who himself might be called upon to serve his leader in battle.